From idea to the market access! X7 Research – CRO established by a group of health professionals with profound experience in clinical trials in a wide range of therapeutic areas performed on a global basis including complex projects of drug market access of Russia and CIS and reverse projects of drug market access of USA and Europe. X7 provides support for substance and drug registrations, enabling rapid and uncomplicated registration for its clients. We make sure you receive the best support during the registration process. During the registration process X7 manages the preparation and submission of the dossier, the supervision of the registration process, communication with the authorities and translation of product texts into local languages. We provide strategies for your medicinal product registration and post-registration activities. X7 is a full service CRO ready to catch your idea and help you develop it into a new product and bring it to the market. Our dedicated team holds years of experience in bringing drugs to new markets. We are especially proud of our experience in CIS region. Our team members have 7 years industry experience on average, we hold 100% repeat business rate, clients trust our talents and we deliver results in medical and scientific areas just as good and fast as in marketing and product positioning. Our team of healthcare professional and drug development veterans with just 4-5% turnover and 7 years of industry experience on average understands drug research & development and regulatory processes and can help clients to advance drug candidates from preclinical research to post marketing, seamlessly navigating through the regulatory approval process in the most challenging regions. Our services include consultations and support on all stages of the projects and I through IV Phases. Looking for a way into CIS or cutting losses on production? Drug localization in Russia is one of the right ways into the question. At the moment $4.8 billion government program aims to boost the local production of drugs to at least 50% of consumption there. This is a part of ‘Pharma 2020’ program and we are here to help with your way in. All of the top-10 foreign companies on the Russian market have already localized in one way or another. Localization of manufacturing and technology transfer will play a major role in the next decade. We are here to be your guide into this challenging and so promising market. X7 is ready to help with your Bioequivalence studies, our staff with 7 years industry experience on average is ready to deliver results on time and on budget. Go contact us if you need an experienced CRO with 100% repeat business rate, which is known industry-wide for its reliability and reputation. X7 uses the most qualified and reliable vendors and manages drug distribution with all its possible challenges. We know the industry and the strategies used for drug distribution and packaging. Regulatory Affairs for clinical trials is as crucial as it can get, especially if the trial is going into countries with hazard regulatory environment. X7 provide expert regulatory services; our Regulatory experience and knowledge of challenging regulatory environment will make all the difference when submitting your clinical trial for approval. Out team has an in-depth understanding of local requirements, we have our submission strategies ready for you and we choose the best approach for effective work with regulatory agencies and Ethics Committees. 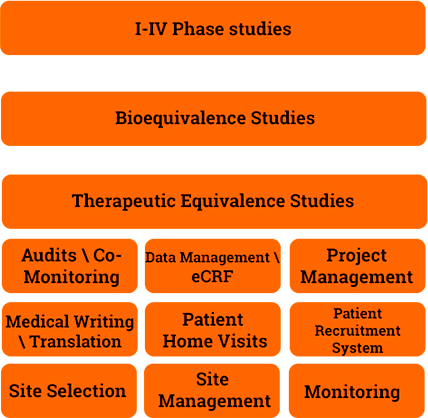 X7 is happy to provide services for Therapeutic Equivalence Studies, such studies aim to show that two treatments have similar efficacy. They may seem easy, but poor study conduct can result in the perception of an increased chance of demonstrating equivalence. That is why it is important to choose the service provider wisely. X7 Research has the most experienced team with just 4% staff turnover, 7 years industry experience on average, with most of the staff being MDs and PhDs, and 100% repeat business rate. These numbers are not a miracle; it is the result of hard work of dedicated team of health professionals. Contact us for details of the best strategies and solutions for your study conduct. Market access is a popular topic to discuss, but how many people know Market Access in practice, have the actual strategy. Having a market access strategy is an imperative, what is it about, what is market access? explaining the difference your product makes to the range of customers who influence the market. X7 team has an insight of successful market access strategy. Contact us to get more information on the topic. Our absolutely free of charge online GCP Course available in English, Spanish and Russian is the best proof of X7 interest in changing the industry to the better and bringing a new quality level to it. We are so highly trained in GCP and other requirements, that the only fair thing we can do now is to share the knowledge with everyone for free, just we have the capacity and resource to leave our mark on the industry. We have trained hundreds of professionals, every day the number of people signed up for the course increases; new people join the program and gain the necessary knowledge. We also ready to provide in person trainings in ICH GCP and other aspects of Clinical Research individually and for organized groups. An independent audit or assessment during co-monitoring visit is an essential quality control tool the industry has to offer. Our experienced team with 7 years industry experience on average is happy to provide quality assessments, independent audits, CAPA investigations, support during preparation to Inspections, co-monitoring visits and more. X7 Research is about quality with our striking 100% repeat business rate! Data management is a cornerstone of X7 services, our globally implemented procedures with quality checks on every step of the process guarantee consistent, high-quality data. We are experienced in managing the data lifecycle in an effective manner. We implement the best practices of Data Management and suggest you contact us for the details on our DM services. We are extremely proud of our team, it is a family. Delivering results is about making an extra effort and having fun working hard, about attitude and this is hardwired into the minds of the people who make X7 Research possible. Project managers are the germs of our team, they are supervising every aspect of the project, responsible for every little detail and for the global excellence. On time and on budget delivery of the projects is the priority of the X7 Global Project Management. Moreover, they make it happen every day year by year. X7 Research provide services in Translation and Medical Writing. All of the Medical Writers are MDs or PhDs. Our experienced Medical Writers provide high quality regulatory documents from the clinical development plan to the regulatory submission. X7 also has a number of translators as part of trial support system. During the registration process X7 manages the preparation and submission of the dossier, the supervision of the registration process, communication with the authorities and translation of product texts into local languages. X7 boasts its unique and highly effective recruitment system, which allows us meeting the timelines and delivering projects on time or ahead of schedule. Our feasibility assessments for regional or global programs provide our clients with a number of best sites in right countries, ensuring predictable and accurate enrollment. We invest extra efforts into enrollment process without extra expenses for the sponsor. Our hands-on experience and everyday communication with key-opinion leaders and investigators guaranty predictable and high enrollment for all the projects we run. X7 can help you with pre-clinical studies; our scientists successfully handle pre-clinical research, as well as provide guidance on the next steps for drug development projects. X7 Research can be your major benefit in cases of upcoming deadlines and tight budgets. You can always outsource to a reliable CRO with a 100% repeat business rate! Contact us to get started. X7 employs more physicians as Project Managers and CRAs than any other CRO. This allows us to better understand the site needs during monitoring, site selection and site management; it builds a better interaction with the investigators. Our success in patient enrollment is a result of in-depth site selection process, as well as our unique patient recruitment and patient home visits systems. Our highly experienced staff with 7 years industry experience on average result in our 100% repeat and referral business. Our Monitors and Project Managers will make sure you achieve your clinical trial objectives. As part of consulting services, X7 is ready to provide our clients with Anti-Crisis Business Solutions. Contact us now for effective support of your goals.